"In one hand Greece holds an olive branch but in the other it holds the sword of justice," said Greece's new Defence Minister Nikos Dendias as he was sworn in on Monday. The danger is, though, that Greece is bringing a sword to a gunfight. Within hours of Dendias taking over the role, the Turkish Navy corvette Büyükada was sailing in Greek waters, not far from Athens. 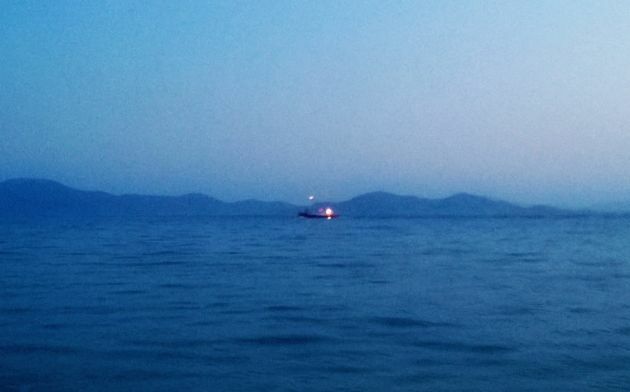 It was the latest unsubtle reminder from Greece’s neighbour that it will not relent from testing the limits of legality in Aegean. The vessel’s course also highlighted the narrow confines in which Greece finds itself: Unable to compete with Turkey militarily but at the same time lacking the diplomatic nous to leverage its position vis a vis its neighbour. These shortcomings have been evident in Greece's foreign and defence policy for decades but there is a sense that the country is gradually being dragged towards challenges that could be beyond its capacity. Writing in Sunday's Kathimerini, Foreign Minister Evangelos Venizelos said that Greece has not faced for six decades the current combination of problems (political, economic, domestic, European, regional, security and geopolitical). Venizelos argued in his op-ed that that Athens has to develop "a Greek stance for each of the individual regional and international crisis" that affects the country. But to what extent is this possible given the rapidly shifting geopolitical situation around Greece and its limited diplomatic reach? The foreign minister suggests the formation of new "strategic relationships" with other countries, such as Israel and Egypt, is one of the ways to achieve the goal he describes. However, Greece's relationship with these countries has largely been forged in recent years and months due to their deteriorating ties with Turkey. Rather than the basis for a long-term foreign policy strategy, this tactic bears the hallmark of a "my enemy's enemy is my friend" approach that has lent a haphazard opportunism to Greek foreign relations for many years. Prime Minister Antonis Samaras travels to Nicosia and then Cairo at the end of the week to strengthen the Greece-Cyprus-Egypt axis of cooperation, with a view to Athens marking out its own Exclusive Economic Zone (EEZ), just as Cyprus did after bilateral agreements with Israel, Lebanon and Egypt. However, Nicosia has discovered that in the see-saw reality of the eastern Mediterranean, the EEZ's demarcation is not enough to ensure peace of mind. Turkey's decision last month to send the Barbaros research vessel into Cyprus's EEZ prompted alarm in Nicosia and Athens. Cypriot President Nicos Anastasiades suspended reunification talks with the Turkish-Cypriots in retaliation. Yet the Barbaros incident highlights the complexities of trying to chart a clear foreign policy course when the region is full of twitchy neighbours. It is clear that the Barbaros's presence in Cyprus's EEZ is part of a longstanding Turkish strategy to persistently object to the provisions of the United Nations Convention on the Law of the Sea (UNCLOS), which it does not recognise, in the hope that this might strengthen any future legal challenge. However, the Turkish move also creates a series of legal complications because Cyprus's EEZ is still considered international waters and other countries' vessels are able to enter the area as long as they are involved in peaceful activities. While Anastasiades sought to free himself of this entanglement by suspending the UN-mediated talks, it looks as if he has created an even more complex problem for himself. By refusing to continue peace negotiations with the Turkish-Cypriots, he has boosted neighbouring leader Dervis Eroglu, who is seeking re-election early next year, and left himself with few serious bargaining chips. Anastasiades's room for manoeuvre is also limited by his minority government's reliance on the Democratic Party (DIKO) to help pass troika-mandated reforms through Parliament. DIKO is led by Nicolas Papadopoulos, the son of the late Tassos Papadopoulos, who led Greek-Cypriots in rejecting the Annan Plan for reunification in 2004, and it favours a hardline approach to the peace talks. The intricacies of the situation were reflected in the relatively lukewarm responses to the Barbaros flare-up from the European Union, the United States and Russia. None of the powers felt the need to wade in and preferred to view the dispute in less cut-and-dried terms than it is seen in Athens, Nicosia and Ankara. There is a danger that the discovery of hydrocarbons off Cyprus, which was seen by many as a potentially binding factor for the two sides, may end up driving them further apart. Nicosia is committed to sharing the revenues from natural gas to all citizens but has made it clear to the Turkish-Cypriots that there can be no agreement on hydrocarbons until a peace settlement has been agreed. The Turkish-Cypriots, though, insist that they should be part of a committee managing the resources now. In the meantime, Ankara has signed an agreement with the Turkish-Cypriots for gas exploration north of the island. The goal of creating a bizonal, bicommunal federation on Cyprus appears, at least for the moment, out of sight. The International Crisis Group broke a taboo recently by going as far as suggesting that the option of a two state solution might have to be considered. “The parties should informally consider the option of mutually agreed independence for the Turkish Cypriots within the EU,” argues the think-tank. The idea has also been broached in a new book by Greek commentator Stavros Lygeros, who has written about Greek-Turkish relations for many years. However, the complexity of the Cyprus problem is not the only reason that the EU and the US are proceeding with caution. The growing instability in the Middle East is elevating Turkey's importance in the region's power struggle. Although Turkish President Recep Tayyip Erdogan has done his best to alienate the West with his capricious approach to ISIS, highlighted by his wavering over whether to allow Kurdish fighters to reach besieged Kobane, the Europeans and Americans cannot afford to write him off. The volatility sweeping through Syria and Iraq makes Erdogan appear almost a stable ally. However, the West’s tacit approval is also providing Erdogan with a shield behind which he can continue to play out his grandiose dreams for his country, epitomised by his new 1,000-room, 600-million-dollar presidential palace, nicknamed Ak Saray (White Palace). As the western powers stand off, Erdogan gathers more power in his hands and polarizes his country further. His opponents see an Ottoman-like zeal in his desire to impose his will, morals and even architectural tastes on the country, while supporters are drawn in by the promise of an economic and militarily powerful Turkey. Even though a growing part of the Turkish public is happy to march to this military beat, Turkey's foreign policy lies in tatters. Ex-Foreign Minister Ahmet Davutoglu's "zero problems" with neighbours dogma has failed. Turkey is now surrounded by problems. What Erdogan will do next is near impossible to predict. Ankara's sympathy for ISIS has been driven by the fact that it is fighting Turkey's enemies (Bashar Al-Assad, the Shias in Iraq and the Kurds in Syria) but Davutoglu's vision of a Sunni arc stretching out through the region now runs counter to the efforts of the West, which is trying to contain ISIS. Perhaps feeling penned in on this front, Erdogan will choose to flex his muscle in the Mediterranean and the Aegean, where he knows he will meet limited resistance. How would Greece respond to this? This, too, is uncertain. For a start, we cannot be sure who will be in power in a few months from now. SYRIZA's inexperience and nebulous thinking on foreign policy, for instance, might create the perfect conditions for Turkey to test a new Greek government's resolve. It would not be the first time: Kostas Simitis had only been in power for a few days in 1996, when Greece and Turkey almost went to war over the Imia islets in the Aegean. Maybe events will take a completely different turn and, sated by his domestic omnipotence, Erdogan will become more amenable. Perhaps the two sides on Cyprus will find a way to work together. Possibly the threat of ISIS will die down in the months ahead, allowing all the players in the region to consider matters with more calm. The question, though, is how will Greece react to developments? Will it be an active participant in the region or will it hope that an olive branch and the sword of justice will be enough to protect its interests? Imho it is a shame for EU that it is not willing to support it's member state in such cases. And Turkey should not forget that this attitude, combined with loss of religious neutrality that Attatürk wisely established, will hamper all desire to become a member of the EU.